The association between food intake and illness is in some instances clearly established (1-3), in others suspected but not proven (4-5) and in a whole variety of conditions a possibility. The present difficulty in confirming the link is in those patients where an IgE medicated response is not present or changes in the level of the globulin not demonstrable. Currently, the only course of action to establish the link is an exacting dietary programme with selected food challenges based on experience or guesswork. In either event the process of identification is laborious and difficult for both the patient and clinician. The Alcat Test provides an alternative method of identifying possible hostile foreign protein by an “in-vitro” test which identifies changes in blood cell sizes. After lysing the red blood cells the white cells are incubated with purified food extracts and the alternation in cell size measured. The process is automated and computer controlled, excluding all subjective observations of cell size or recognition. Therefore the result is a comparison with the normal profile statistically compared with the post incubation specimen. In total for this study 52 separate foods were incubated with patients blood and the dietary programme was based on these. To satisfy this particular test it was necessary to study groups of patients carefully controlled through a series of dieting manoeuvres and correlate the clinical and laboratory result. Deddington Health Centre has a long experience of testing new treatments and diagnostic tools based on a population of patients who have been carefully screened for a variety of conditions. There is a stable population of 7500 with over 120000 problems logged on computer since 1975. It is therefore a simple matter to locate diagnostic categories or syndromes and confirm that symptoms are currently present. It was for that reasons that we were asked to assess the Alcat Test in a clinical environment because we could provide a spectrum of patient problems which might be food related and also complete a controlled study in a short period of time. After a full clinical examination a sample of blood was taken for the Alcat Test, the patient assigned a Study number and an appointment made for the Dietician. On the basis of the Alcat Test results the research worker deleted 6 foods from the listing-3 negative and positive, arranged these in a random order for future food challenges. Based on the remaining negative foods the dietician constructed an elimination diet, explained the diary cards and asked the patient to return in two weeks to the research nurse for assessment. Thus those workers designing the diet and food challenges did not see the patients again after these initial visits. The Diary cards have been kept as simple as possible there being 4 of different colours, one for each symptom groups. The green cards for IBS, white for rhinitis, pink for urticaria and eczema and blue for migraine. Some patients required more than one set of coloured cards where their problems spanned more than one group of symptoms. Medication was recorded on the back of each card. The patients returned after 2 weeks and a research nurse checked compliance with the diet, explained each food challenges to be taken weekly and issued six weeks of diary cards. Patients were instructed to eat the challenged food freely and if any severe effects noted to stop and wait until it was time to start the next food. 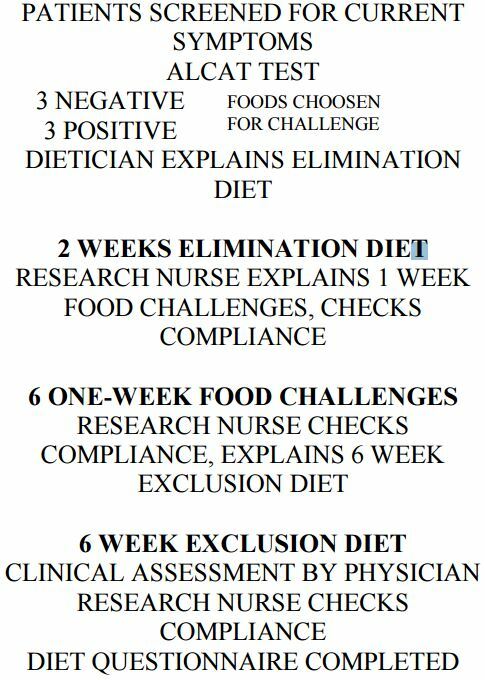 Returning to the research nurse, after six weeks of challenge, compliance was again checked and an exclusion diet arranged for a further six weeks. The end of the exclusion diet represented the end of the study and the patients were then assessed by a clinician and research nurse. A global assessment was made as to whether the diet had been a success or failure and whether any unusually high scores were associated with non compliance. The patients were asked to complete a questionnaire. The purpose of the questionnaire was to determine the regular food profile of the patient as there was some question by the Alcat Test developers that foods not eaten regularly might not react, i.e. be false negative. Furthermore there are considerable transcultural dietary differences between the U.S.A and U.K. and any anomaly which might occur could then be more readily identified.e.g. Corn represented a much more common staple food in the U.S.A. whereas potatoes were more commonly eaten in the U.K. It must be noted that the rate of attrition was large which is not really surprising when one considers the demands and length of the study. The major cause was from non-compliance or agreement to take part was the difficulty in maintaining the strict diet. This in a family situation or where a patient ate out frequently presented a problem. It is also true to say that many of these patients had been chronically ill for many years as the thickness of their clinical notes would testify and many were skeptical of a dietary cause. 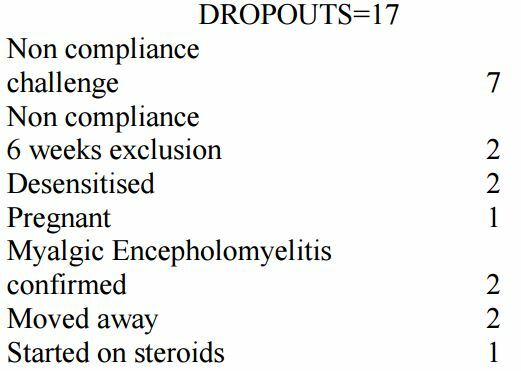 Of those patients who completed the 2/52 exclusion and entered the food challenges there were nevertheless further drop-outs (17) and the reasons may be seen in the next table. Again, the commonest reason being noncompliance with the dietary program. Furthermore, no pre-selection was made and no exclusion criteria incorporated in the first instance. Nevertheless 41 patients completed which were quite sufficient for statistical analysis. The challenge studies were analysed in 53 patients where some results were available, 39 had completed the study and this represented 252 food challenges. The analysis was on “an intention to treat” basis and the data used “as seen” regardless of how well patients had followed their diets. This type of analysis actually mitigated against the test but it was felt important at this stage to be over critical of the results. The mean of the last 3 days of any food challenge was used to minimise carry over. Data was analysed using an analysis of variance and residuals were investigated to ensure validity of assumptions. There was no difference in the mean daily scores between groups (p>0.2) therefore from the challenge point of view we analysed the results as a single group. This combining of data was only used in the food challenge analysed to enhance the validity of the statistical result. The “purposely avoided” group of foods had the highest incidence of positive Alcat Test response where as frequently eaten foods were less likely to produce a positive response. This is contrary to the expected result; the developers of Alcat Test predicted that if foods had not been regularly eaten prior to the test, it would more than likely produce a negative result. Hence, further work on this aspect appears necessary and could be confirmed by a tighter control of the patient population during a pre-test period. The major problem encountered with the clinical validation of the Alcat Test is its failure to indicate a positive result to milk in a wide variety of patients with conditions normally associated at least in part with milk sensitivity. Therefore we consider this an important next step in the research program as this result seems to fly in the face of current clinical evidence and opinion. There was a clear difference between negative and positive challenges (p>0.024). This irrespective of the diseases category it is true to say that an Alcat Test prediction correlated with both positive and negative challenges. 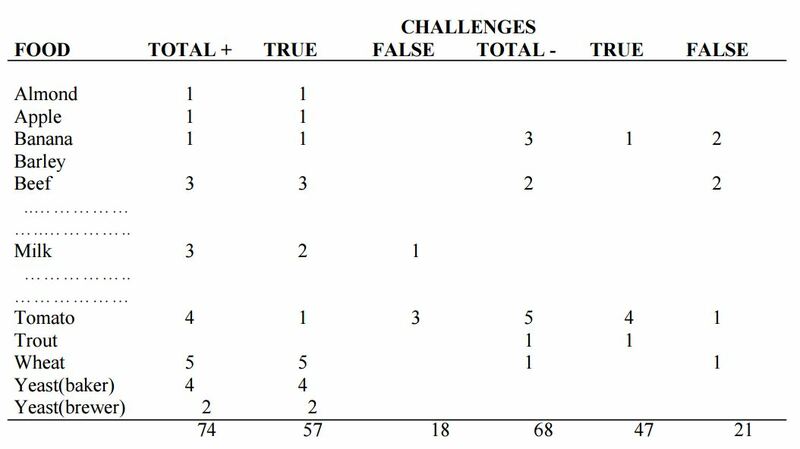 You will see from this table where patients actually managed the full 14 weeks that in total there were 74 positive challenges of which 18 were false and 68 negative challenges of which 21 were false. Unfortunately and by chance there were no negative milk challenges which means a further study will be necessary. This assessment was made at the end of six weeks exclusion diet. The question asked “since starting the diet how do you feel?” then specifically about each symptom on the diary card or added by the patient. In the case of eczema and urticaria an examination of the skin was made otherwise the assessment was on clinical history. Irritable bowel syndrome was the commonest diagnosis in the completed patients and split equally between those who benefited and those who failed to perceive any improvement. Many of these patients had also been investigated from the aspect of possible mold of candida overgrowth or sensitivity. The commonest symptoms in this group were wind and bloating. Consequently we put the 10 failures and 2 equivocal patients onto Nystatin for six weeks and eight at the end of that time had improved. The exclusion diet was also maintained. Therefore I think it is important to reveal these aspects and again further work will be necessary before embarking on one treatment path. The results in migraine, urticaria and eczema and perennial upper airways problems were clear cut with improvement throughout. Several patients reneged during the six weeks exclusion with disastrous results. Otherwise at follow up the patients have maintained their improvement. 1. The Alcat Test works in a clinical situation predicting a dietary programme which benefits a wide range of patients suffering from a variety of clinical condition. 2. Alcat Test positive and negative predictions correlate with subsequent food challenges in a statistically significant number of cases. 3. The Alcat Test simplifies for the clinician the process of designing elimination and exclusion diets. 4. The Alcat Test warrants further investigation in a wide range of clinical conditions where food intolerance may be suspected.